includes photographs and negatives with extensive moisture damage. In 1905 the General Assembly established the North Carolina Geological and Economic Survey, the state's first agency charged with examining natural resources both in terms of economic potential and of conservation needs. In 1925 the General Assembly replaced the Geological and Economic Survey with the Department of Conservation and Development, giving it a broad mandate to expand all services currently offered by the state in the conservation, utilization, and development of natural resources. In the area of forest resources, the department had overall responsibility for forest maintenance, fire prevention, reforestation, and custody of state forests and parks. Under the Executive Organization Act of 1971, the Department of Natural and Economic Resources was created and placed under the direction of a cabinet-level secretary appointed by the governor. This act assigned to the new agency more than twenty different entities, including the Department of Conservation and Development and its divisions (including the forest service). By provision of a legislative act of 1977, the department was reorganized and renamed the Department of Natural Resources and Community Development. This collection was compiled by the Division of Forestry for use in information and education programs on the state of the timber industry in North Carolina. It includes photographs and negatives arranged in alphabetical order by subject matter. The collection has been arranged by subject using the headings created by the originating agency. The collections on the cards are in their original order. The remainder of the collection has been arranged by subject in alphabetical order. 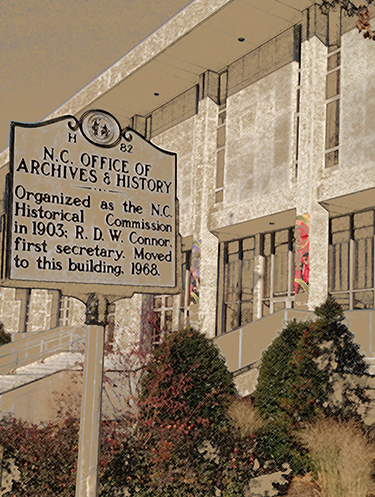 In 1905 the General Assembly established the North Carolina Geological and Economic Survey, the state's first agency charged with examining natural resources both in terms of economic potential and of conservation needs. In 1909 the state employed its first graduate forester in the office of the State Geological and Economic Survey. By a legislative act of 1915 the forester was given the title of state forester and an ex officio position on the State Geological Board. Under the same act, the State Geological Board was charged with responsibility for the prevention and control of forest fires. In 1925 the General Assembly replaced the Geological and Economic Survey with the Department of Conservation and Development, giving it a broad mandate to expand all services currently offered by the state in the conservation, utilization, and development of natural resources. In the area of forest resources, the department had overall responsibility for forest maintenance, fire prevention, reforestation, and custody of state forests and parks. Subject to the board's approval, the director appointed the state forester. Within a few years, those functions relating to the conservation and development of forest resources would be consolidated in the department within the Division of Forestry. Beginning in the 1930s, the Department of Conservation and Development underwent extensive modification, both through administrative directive and by legislative enactment. As an early example of these changes, in 1935 the General Assembly authorized the Board of Conservation and Development to acquire or lease property for the continuing development of state forests and parks, thus insuring future expansion of the program being conducted through the Forestry Division. During the following decade the department's board granted divisional status to the State Parks program. In 1937 the General Assembly appropriated funds to the department for national advertising of the state's resources and attractions, which led eventually to the establishment of a separate Travel and Promotion Division. During the 1930s and 1940s the department began to assist private landowners in the practice of conservation measures. In 1939 the General Assembly authorized the Division of Forestry to conduct inspections and offer an instructional program to landowners. In 1947 the division was authorized to render services in scientific forestry management. The division further expanded its comprehensive services during the decades of the 1950s through the 1970s. By 1950 the division had established one of the nation's first forest insect and disease control programs--an outgrowth of the federal Forest Pest Control Act of 1947 that mandated federal cooperation with states to eradicate destructive insects and diseases. Subsequently, the legislature of 1953 vested the division with statutory authority to investigate, control, or eradicate disease outbreaks. In 1955 the General Assembly authorized the division to enter the Southeastern Interstate Forest Fire Protection Compact. In the same year the legislature directed the state forester to appoint forest rangers as needs required, subject to board approval. In 1963 the division initiated its tree improvement program. During that year the legislature amended previous statutory law, thus expanding the duties of the department to include forestry management, development, and improvement. The General Assembly of 1969 renamed the Forestry Division the North Carolina Forest Service and passed several acts defining its services. The legislature of 1969 also created the North Carolina Forestry Advisory Committee to serve in an advisory capacity to the Board of Conservation and Development. Under the Executive Organization Act of 1971, the Department of Natural and Economic Resources was created and placed under the direction of a cabinet-level secretary appointed by the governor. This act assigned to the new agency more than twenty different entities, including the Department of Conservation and Development and its divisions (including the forest service). The former department and its board retained their previous statutory authority and functions. The department was recreated and reconstituted under the Executive Organization Act of 1973. Under this act the Division of Forest Resources replaced the North Carolina Forest Service. The Forestry Advisory Committee was abolished and replaced by the Forestry Advisory Council. In 1975 the department was again reorganized by executive order of Governor James E. Holshouser, Jr., and the Division of Forest Resources continued under the same name. By provision of a legislative act of 1977, the department was reorganized and renamed the Department of Natural Resources and Community Development (NRCD). The Division of Forest Resources continued as one of several divisions under the umbrella of the new department. The Forestry Advisory Council remained the advisory body for that division. By the mid-1980s a movement emerged to combine into one department those agencies concerned with natural resources, environmental matters, and public health. In 1989 the General Assembly passed legislation creating the Department of Environment, Health, and Natural Resources. Under this act, the divisions of NRCD concerned with the environment and natural resources were transferred to the new department. The Forest Resources Division and the Forestry Advisory Council have continued under this new department. [Identification of item] 84.48, Dept. of Natural Resources and Community Development, Division of Forest Resources Information and Education Photography, State Archives of North Carolina, Raleigh, NC, USA. Transferred to the Archives by the N.C. Department of Natural Resources and Community Development, Division of Forest Resources. Accessioned on August 26, 1981. This collection was compiled by the Division of Forestry for use in information and education programs on the state of the timber industry in North Carolina. The bulk of the collection is comprised of photographs mounted on cards containing descriptive information. These cards were arranged in collections according to subject matter. This arrangement has been retained. Many of the individual cards are missing. Also included among these collections is a group of photographs copied from the album of F.W. Bicknell. This album is also in the Archives. Besides the card collections, this collection also contains many loose photographs depicting various aspects of timber in North Carolina. One large group of such photographs, taken during the 1940's, was too damaged to salvage, but the negatives and most of the captions have been retained in the collection. In addition to the negatives, for many of the collection's photographs there is also a file of correspondence from the Forestry Office concerning their photographs and descriptions of many of the items in the collection. Little River Consolidated School, Bahamia, N.C.
433, Six acre loblolly pine plantation on C.G. Crocker tract, Moore Co.
440, Young stand of pine on "old field" Mecklenburg Co.
442, Longleaf pine stand on E.W. Elliott tract, Cumberland Co. This tract has been severely damaged by repeated fires. 451, Long leaf pine stand on E.W. Elliott tract, Cumberland Co.
454, Bowen tract near Jackson in Northampton Co.
455, Bower tract in Northampton Co. Trees 2" 3" DBH [Diameter breast height]. 465, Hardwood forest on Gray tract, Forsyth Co.
473, View from Forest Service road between Lake Logan and Tenn. Gap, Pisgah National Forest, Haywood Co.
Portable sawmill owned by C.D. Trogden being operated on E.M. Fulp tract near Walnut Cove no. of Frick Mill. Note Riegel tower to right. This planting made in 1937 by CCC crews. Fence shown in photo encloses this plantation and other forest land which is being grazed according to a specific program. 504, Purebred Brahma bulls owned by Riegel Paper Corp.
510, Typical power unit used to operate sawmills in upper piedmont, N.C.
Capacity 3 5 m. per day. No edger therefore edging done on headsaw. Logs as low as 5 indiv. at small end being utilized. 518, Portable sawmill owned by State Hospital, Raleigh, N.C.
525, Loblolly pine plantation in Randolph Co.
569, State hospital, Morganton, Black Fox watershed, which was burned and clear cut in 19?? 596. Portion of R.F. Crouse white pine plantation in Allegheny Co.
614, Atho Young tract in Franklin Co. after cutting to 12" stump dia. limit. This tract thinned in 1941. Note fire damage following cutting for saw timber. 617, G.F. Ryan tract Bladen Co., N.C.
Notre Dame Academy, Southern Pines. 639, Mixed loblolly pond pine in Carteret Co.
663, Warren Bros. tract, Chatham Co.
695, Untreated gate on A.R. Barnhill farm near Pactolus, N.C.
696, Farm gate built in 1935, A.P. Barnhill farm. Pactolus, N.C.
697, A.R. Barnhill farm, Pactolus, N.C.
698, A.R. Barnhill farm, Pactolus, N.C.
699, Post peeler operated by Dr. Vance Perry, Kinston, N.C.
700, Front view of post peeler used by Dr. Vance Perry, Kinston, N.C.
701, Side view of post peeler operated by Dr. Vance Perry, Kinston, N.C.
707, Longleaf pine stand along South River, Carteret Co.
711, Longleaf stand on Big Island, Brunswick Co.
722, Rail fence at top of ridge in western N.C.
725, Residual longleaf pine and young stand of same south of Dixon on US Hwy. #17. 750, Loading poles cut on Tucker tract in Warren Co.
753, Loblolly pine stand after thinning. Willett tract, Warren Co.
768, TSI work on Southern Box and Paper Co. tract in Brunswick Co.
796, Timber stand improvement on Southern and Paper Co.
822, Post treating plant Bladen Lakes State Park. Note storage tank, treating vat, and dry posts ready for treatment. 829, Slash plantation on Riegel Paper Corp, Bolton, N.C.